Many, many congratulations to Jenny and Joe who were married in a beautiful church service in Leigh on Sea, followed by their wedding reception at The Lawn, Rochford on Saturday 15th July. Both keen astronomers their wedding décor had a few stars and planet touches so we were keen to keep this going with their wedding cake. 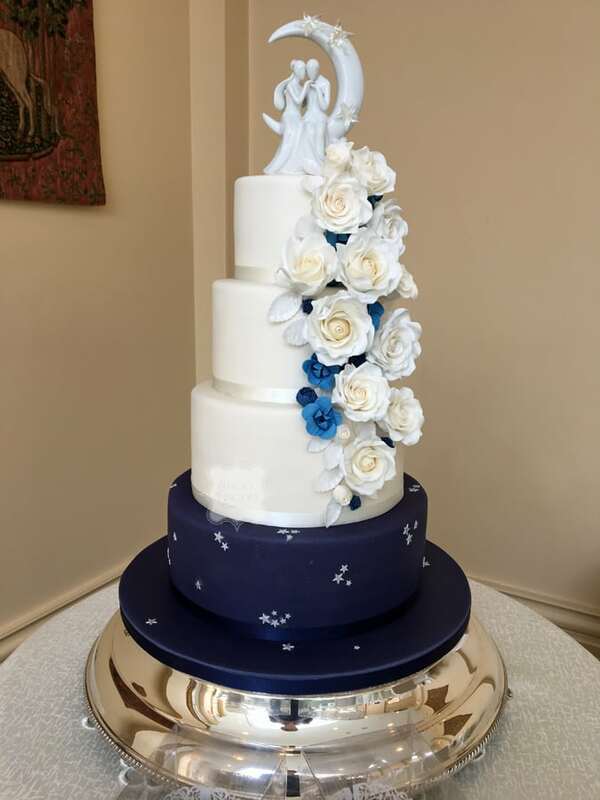 I made them a 4 tier iced wedding cake with the bottom tier in an indigo colour with a bit of sparkle and silver stars in reference to the night sky, whilst the other 3 tiers were in a soft ivory to match the colour of Jenny’s dress. The cake was finished off with a cascade of ivory sugar roses, cornflower and delphinium petals, finally topped off with their gorgeous cake topper. Their flavours were dark chocolate, lemon, white chocolate & passion fruit and finally coffee & walnut. Hope you had an amazing day and I wish you a lifetime of happiness.